Home ELECTIONS MIRIAM SANTIAGO POLITICS RODRIGO DUTERTE Rodrigo Duterte OUT, Miriam Defensor Santiago IN for President in 2016 Elections! 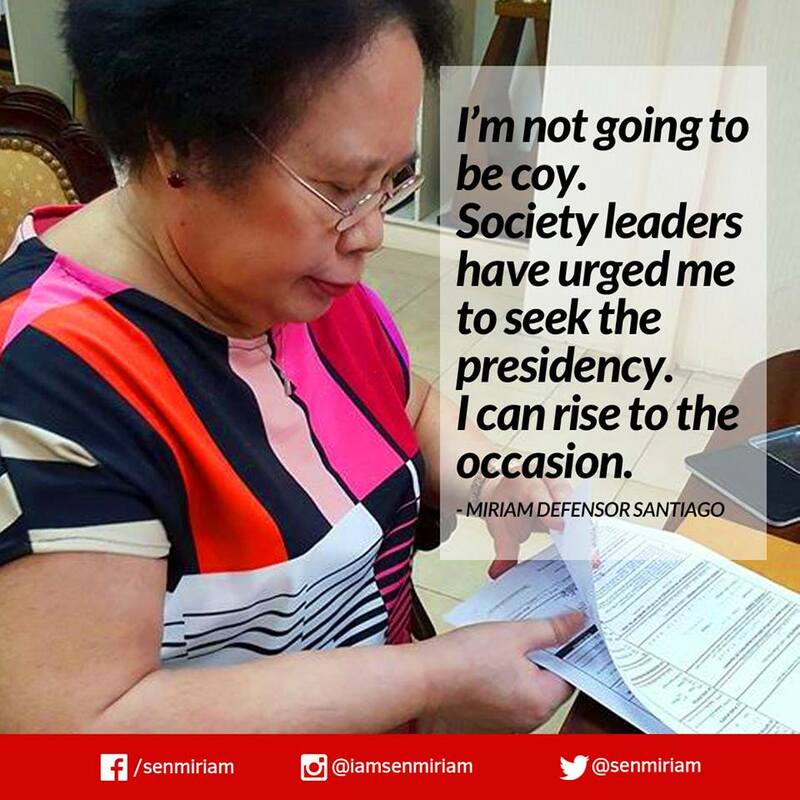 Rodrigo Duterte OUT, Miriam Defensor Santiago IN for President in 2016 Elections! Rodrigo Duterte broke the hearts of many Davaoenos and Mindanaoans after he officially proclaimed yesterday that he is not running for President in the 2016 Philippine Elections. Davao City Mayor Rodrigo Duterte is among the front-runners for the position of President, and it could have been a landslide win for him in the Mindanao areas. Many were looking on a possible tandem of him with Vice Presidential candidate Bongbong Marcos, a reason why many in Northern Luzon also eyeing Duterte as their President to vote for this May. But sadly, according to his official statement released yesterday, he doesn't find the need to run for the highest position in the government, nor even run for VP or even Senate. His only options are re-run as Davao City Mayor or retire. I am sorry to disappoint those who spent much and worked hard and long in support of me as I went around the country espousing the benefits and advantages of federalism. I therefore beg for everyone’s kind understanding and acceptance of my sincerest apologies. After all, there was no ambition for me to aspire for the presidency. The country does not need me. I find no need for it. I guess it is fate that wills that our long journey together should end this way. Time and again, those who believed in me and in the cause that I advocated and continue to advocate, advised me to go for the country’s presidency because that is the destiny that awaits me. But I believe that my destiny is to end years and years of public life in the service of Davao City and every Dabawenyo. Thus, if Inday Sara agrees to run for Mayor, I will retire at the end of my term in 2016. If she does not, the option to be Mayor again is on the table. When all is said in the wake of this decision, perhaps we can find comfort in the thought that this is indeed a beautiful day to end a wild dream. God bless the Philippines. God bless us all! Netizens have different opinions on Rody Duterte's decision not to run for President. Many lauded him for not being too ambitious for a higher position, while others were calling for Senator Miriam Defensor-Santiago instead to run. And this perhaps will ease the heartbreak of not having Duterte in the 2016 Presidential Race: Senator Miriam Defensor-Santiago has already announced just this afternoon that she will run for the 3rd time as Philippine President. The lady Senator announced ir during her #StupidIsForevermore meet-and-greet this afternoon at the National Book Store Glorietta, with his running mate yet to be announced. Now I think Duterte votes will go to her, and will make the Presidential Race still a 4-way fight. Also running are VP Jejomar Binay, DILG Sec. Mar Roxas and the leading candidate in surveys, Sen. Grace Poe.